Inception. I am in danger of becoming stuck inside this movie. I have watched it three times and it is brilliant. They seemingly stuck a camera inside my own dreams, indeed that is how it feels like watching it. Inception toys with dreams merging with reality and does it extremely well in a very entertaining way. It also provided an idea and an insight into my landscape work. I continually look for landscapes bathed in otherworldly light where I can compose and capture a timeless composition that sits somewhere between dream and reality. Hyper reality. It is Earth but not quite as we know it. I am not interested in reality I am interested in creating grand dreamscapes allowing the viewer to Escape in Landscapes. My landscapes are not documentation, when I get it right they are moments of dreams. Cities can certainly become hyper real in the right light. This is the best image I will ever capture of Copenhagen, a large thunderstorm two years ago prepares to level the city at sunset and creates a never to be repeated light. What is your favourite ‘dream’ image? An otherworldly image that feels like you are dreaming it. Can be your own image or someone else, feel free to post a link in the comments. Hurry though, the music may start playing soon. Nature never ceases to amaze me. No matter how many days, nights, sunrises and sunsets I experience, Mother Nature always comes up with something new. It is one of the reasons I love landscape photography so much. Trying to capture these short moments of magic that most people never see, never experience, never even notice. I can think of no greater thing to point my camera at than Nature itself. We pale in comparison. I previously mentioned that the laws of physics seemed warped in Namibia. The clear desert air removed all filters, we had pure 100% Nature. That horizon seemed to always be at infinity. That sky was twice as tall as anything else. After shooting in the desert we would be driving home through the gravel desert. Driving West towards the coast and Swakopmund we were going straight into the most striking fiery red and orange post-dusk light in a banner on the horizon. Not dusk really, but post-dusk, a good 30-40 minutes after sunset. In every other direction no light existed, except for a million stars like diamonds in the sky. To the right perhaps the moon. And always to the left, our trusty night sky companion – The Southern Cross. One time we just had to stop, kill the engine, get out and stare into the universe. Stare back into time. No words can describe it, no camera can capture it. You have to be there. I have attempted to capture some of Nature’s work. They are not necessarily art, but are simply attempts to document Nature warping the laws of physics! 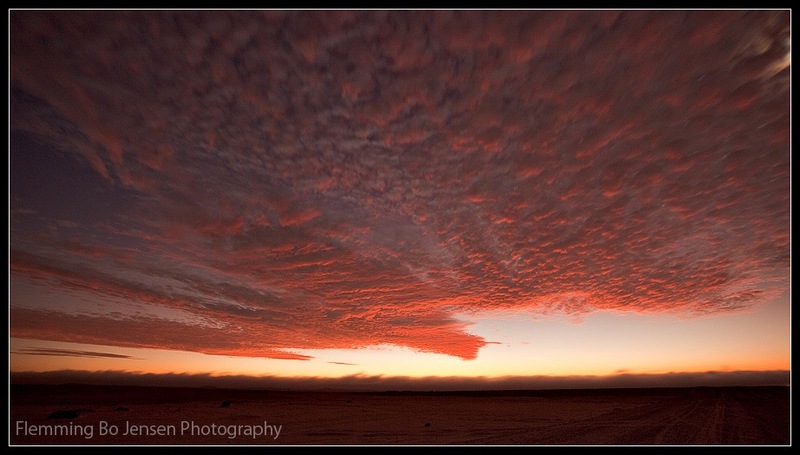 Glowing night clouds in Namibia. This is not dusk light. The sunset lit up the clouds, then they went dark. Then dusk light lit up the clouds, then they went dark. But then…they lit up again! On fire. It was pitch black except for these night clouds on fire. I stared in disbelief, finally had to get out and try and document this. It was pitch black, couldn’t see the camera. It was also blowing a gale. It is a 10 second exposure, iso400, f/6.3 – tells you how little light there was. Live view on my camera gave up, was just blackness. Couldn’t see much in viewfinder so I just pointed. And got this. Night clouds on fire. White part in top right corner is the moon, shame I didn’t get that. The ‘frozen wave’ on the horizon is the infamous mist/fog coming in to swallow the coast and Swakopmund! Dusk lighting up the atmosphere in the Namib gravel Desert, opposite direction of the setting sun. The blue line is actually the earth’s shadow, it is blocking the dusk light from hitting air particles in the lower part of the sky – hence the pink/blue banners. I have seen this many times before but never so clear, so colourful as in the desert! Desert makes everything clearer. 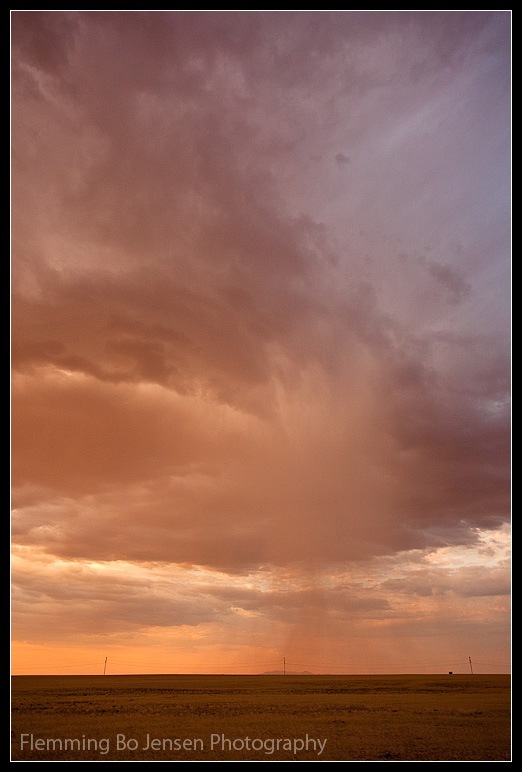 Rain cloud in the Namib Desert, you can see where it touches the ground. Most rain in the desert never hits the ground, it evaporates long time before that. This is a rain cloud that gave us a few hundred drops of water in the middle of the desert for about two minutes. Just enough to register some drops on the windscreen. We experienced rain in the desert! When locals tell you “we had 15 centimeters of rain” that means that they measured the distance between the rain drops and they were 15cm apart! And lastly, a sunset from Cable Beach in Australia where Mother Nature really turned on all the party lights and just lit up every cloud! She also kindly arranged a low tide so I could get mega reflections. I have a stitched 180 degree pano of this coming up, actually for a full 360 degrees the sky was on fire. A 5 minute demonstration of power, of Mother Nature having a party! The camera’s we use nowadays are incredibly advanced hi-tech tools. Yet I always feel I am holding the equivalent of a stone age tool when Nature flexes it’s muscles. Nothing can capture that. Will not ever keep me from trying though! Won’t keep me from having my head in the clouds, walking into things! I am a Nature Junkie! A few months back I wrote my first impressions having just upgraded from Canon 5D Mk I to Mk II. Winter and non-stop grey overcast weather (and mood) has meant I have only shot a few hundred images since then but I still feel I have enough clicks to write my second impressions of this fantastic camera. Camera still behaving very nicely, not a single problem. Upcoming trips to Africa and Australia will test it, Luminous Landscape article (25% 5DMk2 failures in Antarctica) has me slightly worried so the old 5D is joining me! The 14-bit 21 megapixel RAW files continue to amaze. They are truly gorgeous and I love having single shots at this size, more more, I want more pixels (at the same quality of course)! Live view and live histogram is proving incredibly useful, much more than I would have thought. I didn’t think I would use it much but it as a great way of previewing your shot, exposure, aperture, white balance before shooting. It is great for shooting stitched panoramas and it is very helpful with exposure and focus at night. It eats battery power though; I won’t be using it in a desert where I can’t recharge. I am still used to the top button layout of the 5D Mk I, keep pressing the wrong buttons! One thing I would want to change. With the old 5D you could use the wheel on the back of the camera to change aperture in A mode. Here; you have to use the thumb wheel exclusively. I keep changing exposure compensation when I really wish to change the aperture. Battery life is improved greatly over the old 5D and is impressive. Which is a very good thing since a 5D Mk extra battery is simply impossible to find anywhere presently. Sold out worldwide! So I am going to Africa with 1 battery and definitely bringing the old 5D as backup. The HD video results is mindboggling, can’t get over how good the files look (even if my video skills are beyond crap). Can’t get over how big the files get! My PC can’t even play the 1920×1080 files without skipping here and there. To see some outstanding 5DMk2 videos, check out Michael Fletcher and his latest videos. Automatic sensor cleaning. Well…I am cloning out dust spots! It may still work to a certain degree of course; I may have had many more dust spots without it. We shall see how it deals with the sand of Africa and Australia! And…5D Mk II can actually see in the dark! Quite a feat! Many more images and impressions to come as I take the 5D Mk II on the road! For most of the day the human eye is far superior in every respect to any digital sensor or film. Much greater dynamic range, much better colours. Once the light is fading it’s a different story, our human eyes fail and the camera wins. This is especially true for modern digital SLR wonders! It really is a bit magical. Your eyes cannot see anything but when you review the captured photos it’s a bright view into another world. Often people pack up their gear and leave as the sun hits the horizon and they miss the magical dusk light that can last up to 20-30 minutes. So stay, shoot, and remember – cameras can see in the dark! I had told myself that I was not going do it no matter what. No bloody way was I going to do it. No way in hell the world needed another stock image of camels on parade on Cable Beach in Broome. I really like the animals themselves, the camels, but I really don’t get why tourists find it exotic to sit on a camel (or horse for that matter) at sunset. Not too crazy about the camel pushers (as I call them) either. 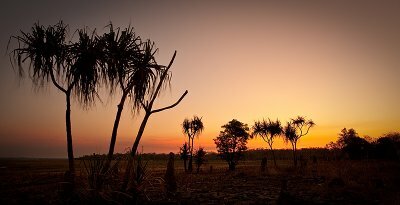 Also every gallery and shop in Broome has wall to wall canvas prints of the camels at sunset. Cliché shot no. 1. is getting those camels silhouetted against the setting sun and I was definitely not going to do it! The story of camels in Australia is an interesting one actually. Thousands of them were brought to Australia in the 1800s for expeditions in the outback as they’re just perfect for the desert-like environment. When cars etc. became available large herds of camels were let loose and not surprisingly they do very well in the Australian outback! Meaning that Australia now has the largest population of wild camels in the world and the camels (of the one-humped Arabian variety) are so genetically pure that they’re exported to the Middle East! Yes my friends; I can tell a good camel tale at the camp fire and can now also deliver the photos. Apparently the world needed just two more camels on a beach images! I am back in Copenhagen after a long 30 hours of flights from Sydney to Denmark. I hardly know how get back to normal life and write normal blog posts again; this time my soul never made it back with me and will forever live somewhere in the outback. I would want to go back tomorrow if possible. Normal service will be resumed shortly on this blog when I find my lost marbles!